So I didn’t manage to do a recording today due to an issue with Camtasia massively slowing down my PC when it’s recording, but it’s probably for the best: I failed! I bit off way more than I could chew in 15 minutes and foolishly decided to make an infinite runner. In theory I would have been fine, but I spent a lot of time needing to tweak values (e.g. gravity, jump velocity, platform min/max width, min/max difference in platform heights) and chasing stupid bugs, and ended up going over the 15 minutes. However, I wanted to have an actual finished game so I decided to keep going and until I had the minimum of what I could label a ‘game’ and count this challenge as a fail. I stopped the timer at just before 40 minutes (! 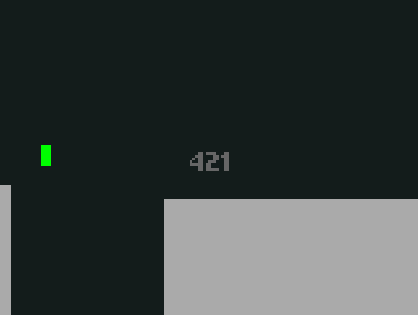 ), which still isn’t bad for a game, but I should have made nearly three in that time! Either keep it simple, or do something complex that you know how to do: I’ve never made an infinite runner before, so I ended up getting caught up in a few places as to the best way to implement something. Usually I’d grab a pen and paper and work it out, but when the clock is ticking I don’t really have much time for that.